Here's my attempt creating a Bongard problem. Find the rule that is correct on the left side, but not on the right side. What is a Bongard problem? If you consider the dots as eyes and the line as a nose, then they are the faces which are not upside down (the mouth is below not above). 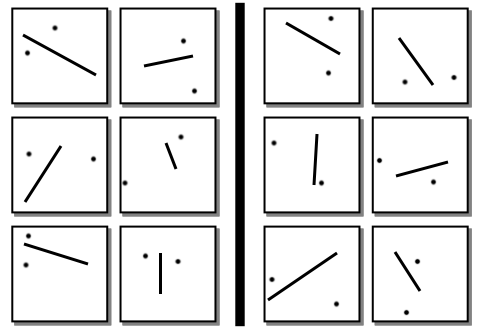 If you draw a line connecting the two dots, the intersection with the original line is on the top-part (top 50%) of the line.